This is one of the Pacific’s best-kept secrets. The Solomon Islands combine the marine life diversity of the Indo-Pacific's Coral Triangle with dramatic underwater landscapes and forgotten war wrecks and relics. Reefs are covered in a variety of both hard and soft corals in almost every hue, and support parades of ornately colored reef fish and menageries of nudibranchs, shrimps and crabs. Volcanic activity and reef-building corals combine to create unique underwater landscapes, and deep walls provide interactions with schooling pelagics. These islands saw ferocious fighting during World War II, and reminders of the conflict can be found both hidden in the jungles and scattered in the surrounding waters. Few other places in the world can match the underwater diversity of the Solomon Islands. Lying on the eastern edge of the Coral Triangle, their remote location and light human impact serve to protect a pristine marine ecosystem that blends Pacific and Indian Ocean species, from micro to mega. Also contributing to the diversity are the geologic forces that forged a unique landscape through a combination of tectonic uplift, volcanic activity and coralline formation. In everyday terms, this translates to a mixture of lava tubes, underwater caverns, walls, pinnacles, coral bommies, barrier reefs and muck-bottomed bays. Add to this the wrecked ships and sunken ordinance of a World War, and the result is a destination that has something of interest for almost every diver. Water temperatures remain between 83 and 85 degrees year-round. There's plenty of easy diving to be enjoyed, but this is also a great destination to add variety to your logbook. From cavern and wreck dives to drifts, big animal encounters, muck dives and shark encounters, you'll earn plenty of bragging rights. None of these adventures are beyond the grasp of a competent recreational diver, but to take full advantage of the trip, you might want to brush up on your general diving skills and consider a few specialties as you prepare for travel. Silhouette your dive buddy in the narrow chasms of Leru Cut for a dramatic photo op. When suspended on the colorful wall at Uepi Elbow, look for passing eagle rays, hammerheads, and mantas. A rare double-barrier reef surrounds Marovo Lagoon. Scattered and broken remains of war wrecks now hide macro life at Garbage Bin. Artifacts from sake bottles to tanks adorn the Toa Maru. Banded pipefish hide among the pilings at Gavutu Wharf; sharks swarm the channels ay Njapuana and gorgonians grow to diameters of 10 feet at Fantastic Fans. Though waters can be bathing suit warm, a 3 mm suit is still a good choice to prevent body core temperature drops after several days of repetitive diving. Add a dive light for caverns, canyons and wrecks, a deployable surface marker for drifts, a reef hook to hold a position on current-washed points, a muck stick for poking around shallow sites, and by all means a camera. Offering some of the best diving in the Pacific, Papua New Guinea (PNG) earns a spot to be included on your bucket list. Papua New Guinea dive sites are unspoiled and isolated that new marine species are still being discovered. Hammerheads, whale sharks, mantas, dolphins, and pilot whales are easy to spot here. There is world-class muck diving for Macro lovers and a dream destination for the adventurous diver. 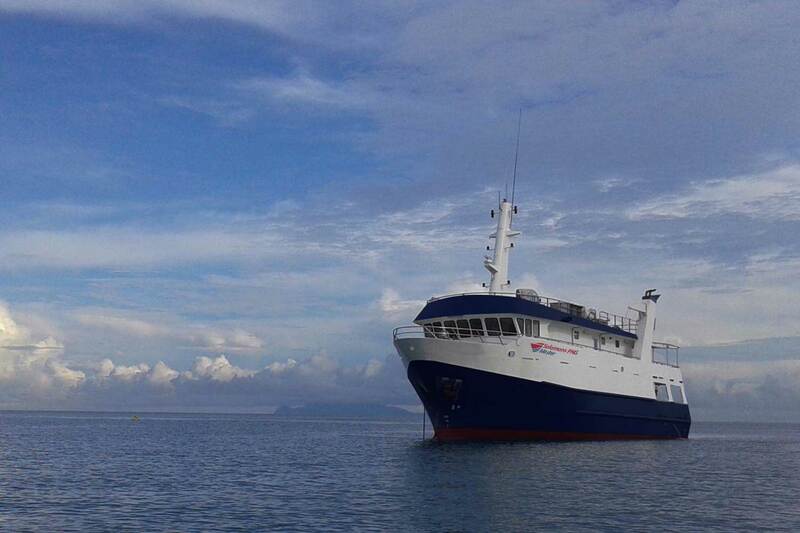 The MV Bilikiki has been providing access to the Solomon Islands best diving since 1989. Itineraries range from 7 to 14 nights and include a variety of dive experiences including pristine reef dives and historic World War II wreck dives, with up to 5 dives per day. Visits to local villages are also included on every trip.These trips sell out quickly so contact us to confirm current availability or for information on 7, 11 or 14-night itineraries. The MV Bilikiki has been providing access to the Solomon Islands best diving since 1989. Itineraries range from 7 to 14 nights and include a variety of dive experiences including pristine reef dives and historic World War II wreck dives, with up to 5 dives per day. Visits to local villages are also included on every trip. These trips sell out quickly so contact us to confirm current availability or for information on 7, 11 or 14-night itineraries. The Solomon group includes six major islands that align in a row running some 700 miles from southeast to northwest, surrounded by nearly 1,000 smaller islands. The majority of diving activity take places in the central island group, and international travelers arrive in the capital of Honiara on the primary island of Guadalcanal. From there, liveaboards provide access to sites around half-dozen additional islands, and inter-island flights connect to dive lodges serving Marovo Lagoon and the north province settlement of Gizo. Guadalcanal was the site of some of the fiercest land and sea battles of World War II. The channel between the Florida Islands has earned the nickname Iron Bottom Sound due to the 200 ships, 690 aircraft, and countless landing barges that sunk there during many months of battle. Experience wreck divers come to Honiara to explore a number of historic warships that lie at the lower limits or beyond the normal range or recreational diving.There are also a number of mid-depth wrecks in the area, including a trio of Japanese ships that sit in shallow water and can be accessed as shore dives. Liveaboard cruises originating on Guadalcanal visit sites around the Florida Islands, Russell Islands, Mary Island and Marovo Lagoon. This region provides a tremendous diversity of landscapes that includes pinnacles, caverns, long lava tubes, shallow coral gardens and walls. Another common feature of these islands is rock promontories that project into blue water. Done as a drift, or by hooking into the reef when currents are strong, visits to these structures yield sharks, big schools of tuna, trevally, barracuda and bump head parrotfish. The most famous point dive is at Uepi, where currents flowing from Marovo Lagoon carry nutrients that attract a food chain that starts small and through large schools of trevally and barracuda, to rays and reef sharks. Other popular options are Barracuda Point on Mary Island, where clouds of jacks and barracuda numbering in the hundreds form swirling clouds, and Devil's Highway, where mantas gather. The Russell Islands are known for deep, cave-like clefts in the reefs that extend shoreward into the jungle canopy. One of the largest and dramatic of these is Leru Cut, which is included on most all itineraries. A different type of cave is found in the Florida islands. The seamount, known as Twin, is perforated by a pair of large lava tubes that lead divers through the reef wall to a dramatic exit point at a depth of 110 feet. Like a number of sites in the Solomons, the upper lip of this wall leads to shallows covered in hard corals and soft corals that reach almost to the surface. These reef tops allow for long multi-level dives that end with extended searches for finds such as pygmy seahorses, hairy squat lobsters, cuttlefish, octopus and nudibranchs. Prime sites for critter and artifact hunting can be found around abandoned piers from the war era. Here, among the twisted remains of small war wrecks and discarded ordinance, divers can find banded pipefish, crocodile fish, nudibranchs of all sizes and colors, schools of glassfish, mandarin fish and more. Calm water can also be found in Marovo Lagoon, which is surrounded by a rare double-barrier reef—one of only six known formations of this type in the world. It is also thought to be the world's largest saltwater lagoon. Its interior is filled with coral bommies and patch reefs that will provide hours of fish watching. Channels leading into the lagoon also become gathering points for reef sharks during tide changes. Gizo offers a good mix of healthy reefs, wrecks, and diverse marine life. This region is steeped in WWII history, including the island where John F. Kennedy and crew met a Japanese torpedo aboard PT-109. Among the top dives, is the 442-foot Toa Maru, littered with artifacts from sake bottles to ammo, and covered in substantial hard and soft corals. Kennedy Wall is a great place for pelagic action, and Grand Central Station for a potpourri of marine life in every niche. Entry/Exit Requirements: All U.S. citizens are required to present a valid passport which must be valid at the time of entry into the country. Proof of onward or return ticket may be required. No visa is required, a visitors permit is issued for stays less than 42 days. All persons leaving the Solomon Islands, pay a Government Departure Tax of approximately $13 U.S. which should be included in your international ticket. No immunizations are required for entry into the Solomon Islands. You should check with your doctor and the Centers for Disease Control on recommended vaccinations for travel at cdc.gov. In an age of global culture and instant connectivity, the Solomon Islands provide an oasis of iconic cultural traditions, and a chance to rediscover lost reminders of the 20th Century's greatest conflict. This is one of the least densely populated Pacific Island Nations, where thousands of square miles of jungle remain untamed, and human settlements are found on fewer than one in six of the nation's 990-plus islands. At a majority of villages, life continues as it has for centuries—minus the practice of headhunting, which went out of vogue in the early 20th century. Today, Solomon Islanders are not cut off from the outside world, but neither are they in a rush to embrace it. When a village elder greets you while wearing a grass skirt, it's not an affectation staged for tourists, but rather a part of everyday dress. Shamans and sorcerers still hold sway in matters of birth, death and healing. And while islanders may go to church on Sunday, when it is time to go fishing, they will pray to the shark spirits for a bountiful catch. Visitors will find these people to be welcoming and friendly, though communications are often confined to smiles or the serving of a shared meal. English is the country's official language, fewer than two in 100 speak it, and islanders communicate in various pidgin dialects that bridge the gaps in the more than 70 unique languages spoken on different islands. Elders may recall the days when American and Japanese forces fought pitched battles on land and sea, and on most every island you will find abandoned reminders of the war. Electricity in the Solomons is 230 volts, 50 cycles, so an adapter will be needed for U.S. visitors. The outlets use 3 flat pins similar to Australia. The country code for the Solomons is 677. Check with your cell phone provider for international plans that may include data, texting and voice. Some resorts offer WiFi. It is recommended not to consume the local tap water. It is best to drink bottled water. English the official languages, however, most Solomon Islanders speak their local language and pidgin. The local currency is the Solomon Islands Dollar (SBD), referred to locally as S$. Click to check the currency rate. There are 2 branches of banks, MSP and ANZ with ATMs in major cities and major credit cards are accepted for purchases. The Solomon Islands utilize SBT which is Solomon Islands Time. It is 11 hours ahead of Greenwich Mean Time (+11 GMT). The Solomons are located west of the International Dateline and they do not observe Daylight Savings Time. The Solomon Islands are located in Oceania, to the east of Papua New Guinea and northeast of Australia. They encompass over 11,000 square miles and a total of 3,301 miles of coastline. The Solomons include 6 major islands and over 900 smaller islands. Islands include Guadalcanal, Malaita, Santa Isabel, San Cristobal, Choiseul, New Georgia and the Santa Cruz Group. Honiara, the capital, located on the island of Guadalcanal, and is approximately 8.5 square miles. The population of the Solomon Islands is 583,591 (2015).